You just bought your second computer. Perhaps you purchased a new laptop, a tablet, a new machine for your spouse, or maybe just another machine for yourself. Perhaps you just want to connect your smartphone via Wi-Fi when you’re at home to reduce the usage of your mobile data plan. You’d like to be able to connect them all to the internet and it’d also be nice to be able to share things, like printers or extra disk space, among your machines. The basis of your LAN will be ethernet. The word has a very specific technical meaning, but in common use, it’s simply the technology behind 99% of computer networks. Most computers now come already equipped with an ethernet adapter – it’s the squarish hole that accepts what looks like an oversized North American modular phone jack. Your broadband connection being cable, DSL, or something else will first go through some kind of device typically called a modem (again, somewhat technically inaccurate, but it’s the common term). The modem’s job is to convert the broadband signal to ethernet. You’ll connect that ethernet from your broadband modem to a broadband router. Routers control two important things – as the name implies, they “route” information between computers on your LAN and between those computers and the broadband connection to the internet. The other important function (if you get what’s called a NAT router) is that they provide a very efficient firewall – protecting the computers on your LAN from many of the dangers of the internet. As a side effect, a NAT router allows you to share a single broadband connection among multiple computers and other networked devices. Each of your computers will need an ethernet adapter and most will already have them. An ethernet cable will run from each computer to the router and another cable will connect the router to the modem. 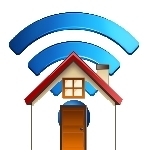 leo notenboom home network, wireless home network. permalink. If malware gets into our machines hidden in the belly of what appears to be good info you are downloading, can we not break the link at the point of arrival? We type characters, we read characters. What about having at the arrival point a “screen” of set standard characters and a camera reading those characters and recording them in the receiving computer. In that case, how can malware code get into the receiving machine? Just a thought!